Welcome to finance of the future. With all of the technological innovation around artificial intelligence, apps, and financial forecasting, it seems like Finance and Accounting (F&A) has hit its version of the space age where no one needs to work because the machines take care of everything. Unfortunately, that’s just not the reality. While there are incredible technological advancements happening for F&A, the adoption rate for those technologies is relatively low. This has created a disparity between the expectations of what F&A can provide and what it is actually providing. Nowhere is this clearer than in the aspirations of the CFO and the reality of what’s possible in most Finance Departments. Leaders in Finance, CFOs in particular, struggle to meet the needs of business and find the support necessary for them to succeed. This is primarily due to the fact that Finance Departments themselves don’t have the tools they need for success. Those tools can be divided into two categories: Processes and Technology. Both processes and technology are necessary to support the Finance Department, but processes should be addressed first. In an era where all questions can be answered by typing a few words into a search engine, the idea of being unable to have immediate answers, or having to spend endless hours compiling data to create consumable information, is outdated. Or at least the world of Business finds this idea outdated. For the world of Finance, it’s a reality that limits F&A’s impact on business and frustrates the people who struggle daily to work with disconnected processes and outdated technology. Unfortunately for CFOs, there is a void between the ideal they strive for and the reality they live in. This void is generally a result of poor process organization across a global business and a lack of technological support within the Finance Department. While these problems can be partially fixed with modern technology, such as automated financial software and recent advancements like RPA, tech shouldn’t simply be spread on top of broken processes. As the old saying goes, you have to walk before you can run, and many Finance Departments are struggling to close the books error-free and on-time. With the current processes in place, there is no hope for them to deliver the support CFOs need to accomplish the enterprise goals of 2017. Before achieving on-demand analytics and all of the other modern miracles technology offers, Finance Departments must first understand and fix their underlying processes. So where do Finance Departments begin? At the very, very beginning: with their close checklist. All Finance Departments have checklists for the monthly close process. The problem is that those checklists are often incomplete, disjointed, and vary from one shared service center (SSC) to another. 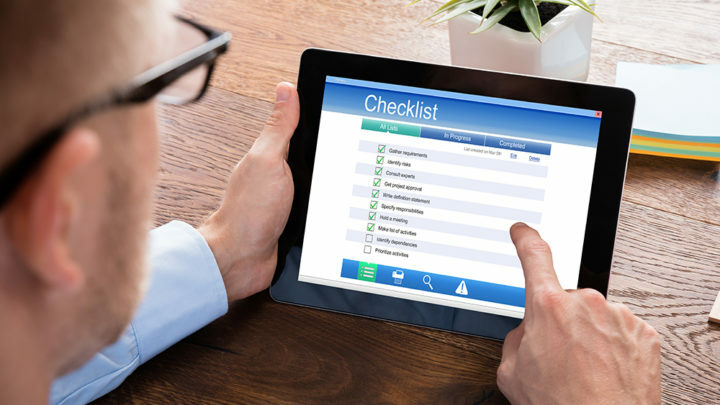 While checklists may seem too basic to be worthy of an overhaul or too small to have such an impact on the goals of the CFO, they are an essential part of the close process. They show which tasks must be completed, by whom, and by when — information that is essential to complete the close process. By starting with evaluating the month-end close checklist, Finance Departments take the first step toward process standardization — ensuring that an SSC performs the close correctly, every time. After this process is standardized, it can be synchronized across all SSCs. While checklists are incredibly valuable, a checklist alone will not provide CFOs with the necessary support to become a partner to Business. Checklists can only provide basic information. They cannot ensure the quality of the close process, prove its accuracy, or reveal if the close is on schedule. For that, technology is needed. Checklists also cannot provide the required level of security and insight that businesses need, especially global organizations, which generally have to execute more than 300,000 monthly activities across various SSCs and time zones during the month end close. Finance Departments need more than a checklist and clear processes. They need technology to equip them to support the CFO. With the speed and demands of modern business, not just any technology will support the CFOs goals. It needs to be flexible, fast, and fail-proof. Continue with Part 2 of this blog to learn how CFO’s can rise to the challenges of modern finance. Previous story What Is A Journal Entry?